Every year I do a list of top predictions for the coming year for the stem cell and regenerative medicine field. For example, you can see past top 10 predictions lists for 2013 and 2014. What’s in store for 2015 from the stem cell crystal ball? There is so much going on that for this coming year I’m making 20 predictions, some upbeat and other more discouraging. They are listed below in no particular order. FDA ‘breakthrough’ on stem cells. FDA grants an investigational stem cell biological drug therapy the breakthrough status designation. Adult & pluripotent stem cell advances both impress. More encouraging publications and news on the clinical and translational fronts for both pluripotent and adult stem cell drug development including MSCs. Doc training in stem cells. More new academic-related training programs for doctors to be true stem cell and regenerative medicine specialists. Big pharma’s big interest in stem cells grows further. Big pharma’s interest in stem cells & regenerative medicine continues to grow including at least one major development that might be takeover of a stem cell biotech or something else. There are some small stem cell biotechs that seem ripe as takeover targets. RTT spread. At least one more state (and probably more) pass Right To Try (RTT) laws setting up a collision course between state and federal laws on investigational drugs including stem cell products. Pro sports gets a bit more serious about dubious stem cell “treatments”. A pro sport players association or league acknowledges growing and difficult stem cell issues for players. More high profile stem cell paper problems. At least one and probably more major stem cell paper problems pop up and could include retractions. The UK Parliament OKs 3-parent baby tech. The parliament approves 3-parent/mitochondrial transfer technology, but more steps are required before it is practiced in humans. Stem cell clinic chains Cell Surgical Network and Stem.md continue to grow for at least the first half of 2015 and probably beyond. They operationally challenge recent FDA draft guidances on adipose and minimal manipulation. STAP-related news on the American front. We learn something on the US side of the story of the retracted STAP cell Nature papers. Muddier stem cell waters. More mixing of “legit” stem cell companies and researchers with the non-compliant side of the tracks. More stem cell paper debates and developments on PubPeer. A volatile situation continues with notable twists and turns. IPSC RPE safety. The IPSC-based RPE trial for wet AMD in Japan continues in 2015 without a reported safety hitch. A stem cell biotech finds itself in a hairy situation. What a tangle. At least one patient is harmed or files suit for a dubious stem cell clinic treatment. This is a sad prediction, but unfortunately I think it is likely. VSEL hell. There will be even more bad news for these Sasquatch of stem cells after the Weissman lab paper that seemed to refute these “very small embryonic-like” stem cells in 2013. What does this mean for NeoStem ($NBS)? Celltex is going for an IND. This is an interesting development. GOP on stem cells. Republications make some noise on stem cells or personhood. FDA back in the game of taking action on dubious stem cell clinics. After a long quiet period in 2014, the FDA takes some action on dubious stem cell clinics. Stem cell-based organs. The red hot trend of bioengineering organs and tissues in part using stem cells as a material continues to develop. Note: beyond psychic powers I have to give credit to numerous sources that provide information that helps me with my reading of the stem cell tea leaves. Like anything that mentions crystal balls, this post is not meant as financial or medical advice. 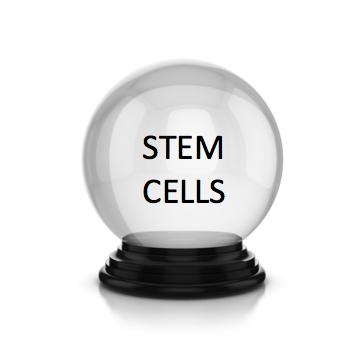 At mid-year, how are my top 20 stem cell predictions for 2015 doing? FDA to Put Mushrooming Fat Stem Cell Clinics on Crash Diet? Um, what does this prediction actually mean? A stem cell biotech will try to go after the hair loss market? Paul, I cannot tell you how much I hope you’re right about this one. But I’m reserving judgment until we know a LOT more about what’s happening with that trial. Here is one additional prediction: the very first allogeneic adipose-derived MSC phase 3 trial by Belgian company TiGenix is successful in treating Crohn’s fistulas (as their phase 2 trial already proved statistically significant efficacy in this indication). Wouldn’t that be some major news in the stem cell field ?